We awoke in the morning to a perfectly fine and sunny day and decided that it'd be a great opportunity to day trip out to Noboribetsu. For some reason we didn't book the train, hadn't had breakfast and the train was leaving in a few minutes! After dashing to the station Kate ducked into that bakery we saw yesterday and grabbed one of those big Hokkaido shaped bread things. The bread looked like it was their best selling product and was called Hokkaido Tokachi Milk Bread (北海道十勝 ミルク パン = North + Sea + Road | 10 + Victory | | Milk | Bread = Hokkaido | Tokachi | Miruku | Pan). Tokkachi is a region of Hokkaido and the milk bread is known for being soft and fluffy with a strong milk flavour. It's made using milk from Hokkaido and if you want to try making it yourself here is a recipe in Japanese and a couple more in English. We only managed to get on the train in the nick of time and by the time we made it to the unreserved section we realised it was so full that we couldn't even sit next to each other! This wasn't a huge issue though as during train trips I usually do my anki cards and Kate watches TV shows on her mp3 player (an iPod). Whilst the whole area is called Noboribetsu (登別 = ascend + separate, the name is from the Ainu nupur-pet) the hot springs and geothermal activity (Hell Valley) are located up in the mountains in the small town of Noboribetsu-Onsen. The closest the train gets is the town of Noboribetsu which is located by the ocean about 6km away. When we got off the train we had a look around the station and confirmed that they had big enough lockers and that we probably would have had enough time yesterday to stow our luggage- although the day still would've been non ideal because of the rain. At the station there were also a few ads about the Noboribetsu bear park which I hadn't heard of before. While we were looking around the station we noticed that you could get a discounted return bus pass to Noboribestu-Onsen from the JR ticket counter. So we purchased our pass as well as some sparkling grape juice (from a vending machine) and caught the bus. A short bus ride up the mountains later we arrived in Noboribetsu-Onsen! At the bus terminal there was a kind of tourist information centre that we had a quick look in. There was lots of information about the bear park/zoo as well as discount coupons. We were pretty tempted to go but ultimately decided not to as we were a bit unsure if the bears would be happy as there are some Japanese zoos where the animals are not treated so well. And we didn't want to see sad bears. We spent a little bit of time working out what direction to head in order to get to the Jigokudani or Hell Valley (Jigokudani = 地獄谷 = Ground + Jail + Valley), once we worked it out though we started making our way up the hill. While we were walking up a little old man started talking to us and asking us where we were going, we told him and he said to keep walking up the street and that it was behind a big hotel. He also said that we were very lucky to come on such a nice day as it had been raining for days. He was very enthusiastic! On the way up we passed by a convenience store, and since I hadn't had much for breakfast we stopped in and I got an Ume (Plum) rice ball. The rice ball was nice and all, however, this unassuming convenience store was to be the site of an amazing explosion of delicious taste. That'll come later though. There were a few other stores along the way and just before reaching the main hell valley area we passed by a park that had a lot of steam coming out of it! We went down to have a look and it was coming out of a pool of water within a man made cave. It had died down a fair bit by the time we got down there but was still interesting. There was a sign that said about every 90 minutes there would be a geyser that often reached several meters tall! Unfortunately we didn't get a chance to see it. From the park we continued up a road and into Jigokudani. The hell of Noboribestu is a lot more geothermally active than Osorezan and unfortunately it’s therefore too dangerous to allow tourist to freely roam around. Lest some hapless tourist gets broiled by steam or sinks into some boiling mud, the more active/unstable areas are fenced off. However, there is still a good view of the valley available from a viewing area near the entrance and you can actually get pretty close to the activity by following a boardwalk that leads down into the valley. Apart from the actual hell valley there are a few other areas of interest including a sulphurous lake and a warm stream. The aforementioned board walk is one of a number of walking paths in the area connecting the various attractions. While we were looking at the valley and considering what route to take a tourist information man approached us and supplied us with some masks and an English map of the area. The masks were "Oni" or demon masks. I guess since it was hell valley. We decided to walk down the board walk first and found that it lead to a pool of water which started steaming up shortly after we arrived and became quite active! It wasn't shooting out water but a heap of steam was bubbling vigorously out of the pool. It was quite exciting and we took some videos of it frothing away. After the board walk we continued on to one of the main walks that connects the valley to the lake. It was a pleasant 30 minute walk amongst the autumn foliage. Along the way there were some signs with a little quiz asking about the area and it's history such as "What mineral is in the water?" or "What is the circumference of the lake?". I'm not a hundred percent sure but I think we basically walked up a ridge/hill and then down the other side in order to reach the lake. Before reaching the main lake we stopped at a much smaller one, more of a pond, that was letting off so much steam that we could only barely see the surface at times. We spent some time here taking photographs and nearly fell in trying to get ourselves in the shot! There was a paid car park (with a man in a booth) separating the two lakes so you could drive here if you wanted, although we enjoyed the walk. We had many views of the bigger lake and took even more photos as we walked along the road which curved around the lake. Although this larger lake wasn't as active as the smaller one there was still plenty of steam coming off it. It was quite picturesque at times with the trees were a really pretty vermilion colour. Along the road there were some large boxes with shopping bags full of dirt in them for some reason. I have no idea what they were for. Kate thought they might be so people could fix the pot holes in the road- which sounds plausible. Although I’m not a hundred percent convinced. If anyone has any idea what they're used for let me know in the comments! Near the dirt boxes we found another walking track which was the main reason we came up the road. This was our final leg and lead down to a stream that feeds or is fed by the lake. The stream is unusual as the water is not cold but warm and there's a foot bathing area located along it! The track was a little muddy in some places but was ok as long as you walked on the sides. Other than that it was a really pleasant walk through the forest. Just before reaching the stream we passed another small pond that had a lot of steam bubbling out of it. When we arrived at the foot bathing area we found that it consisted of some wooden platforms by the side of the little stream and that there were a number of people using it. We walked further along the path until we reached the end before returning to the bathing area and after a little hesitation we stuck our feet in. It was a little tricky finding a place along the bank that was both stable and dry. Getting our socks and shoes off without getting them dirty or wet was also a challenge! The foot bathing experience was alright although not fantastic. The water was more lukewarm than hot and the bottom of the river was a bit slimy! There were also a few midges around although they did not bite. While we had a feet in the water a lady came up to us and said "Agemasu. Purezento" (I'll give you this. Present), and gave us a towel! It was a hello kitty towel and she took off before we could say anything! The towel was useful for drying my feet when I got out, although I didn't know what to do with it after I used it. Since the lady who gave it to us had already left I figured she didn't want to back. I ended up putting it in a plastic bag before putting it in my backpack. I'd deal with it later. After the foot bath we retraced our steps back to Jigokudani although we took a slightly different path for the last little bit. By the time we arrived back at Noboribetsu-Onsen Kate was really hungry. We had a little look at a few of the restaurants on the way back to the bus terminal but we decided that we'd get lunch once we arrived back at Sapporo. While we were waiting at the bus terminal we noticed that some other people had ice cream! We wanted ice cream. Since there was still another 20 minutes until the bus we decided to go hunting for some. This lead us back to that convenience store I mentioned earlier. Kate got some ice cream in a little tub with a spoon - I think it was vanilla flavoured. I'm sure it was delicious. I however got something super delicious. It was cheese favoured ice cream in a waffle cone! It was pretty brave of me actually, to get the cheese flavoured ice cream and I was pretty apprehensive about it. I think I was hoping the flavour would be similar to the Hakodate cheese cakes- and it was. Creamy cheesy and exceptionally yummy. Fortunately Noboribetsu wasn't the only place you can get this ice-cream and I had them a few more times, unfortunately it was only a few as I could only find them in Seicomart convenience stores. During our trip I only ever saw the Seicomart chain in Hokkaido although it appears they have a couple of stores in both Ibaraki and Saitama (located near Tokyo) as well. I'm not sure if they'd have the ice cream there though as it seems to be a Hokkaido thing. Hopefully! Since the bus showed up before I'd finished eating, I had to take the rest onto the bus and I was a bit worried as you're not allowed to eat on the buses in Brisbane. I didn't see any signs saying no eating though and happily it didn't cause any problems. 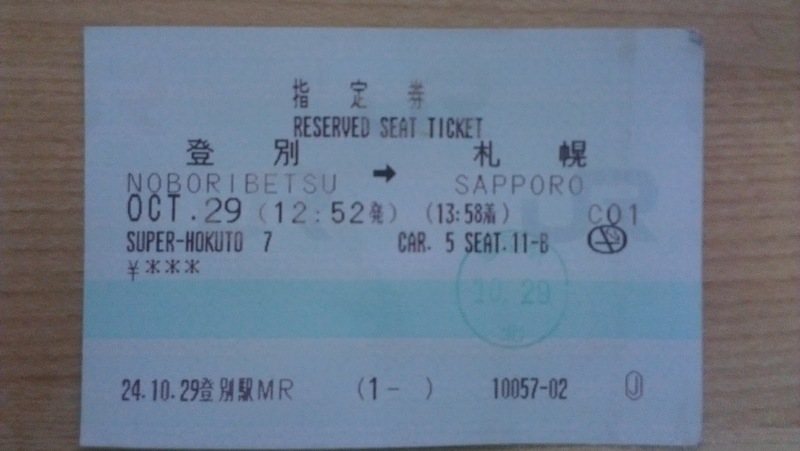 Once we arrived at the station we had a short wait until the next Sapporo bound train arrived and this time we made sure to reserve a ticket in advance. After we had our tickets I used the station bins to clean out my backpack a little and since I didn't really want to keep the old towel I threw it away. We had heaps of fun exploring Noboribetsu and the whole area is home to a number of other interesting natural attractions. I think it would be nice to return one day, relax at one of the ryokan and explore the nearby Lake Toya and Lake Shikotsu regions. A few minutes before our train was due the ticket man went to the door and checked our tickets and told us what platform to wait at. Some people got their tickets checked and crossed over to the opposite platform. This caused the ticket man to freak a little and he started yelling and gesturing at them to come back over to our side. I guess he was worried that they'd miss their train. The people just waved and smiled at him though and stayed on the other side so they probably knew what they were doing. I figured that they were probably waiting for a later train, although it would’ve said this on their ticket which the ticket man checked. For our own part we actually lined up at the wrong part of the platform so when the train came we found our carriage was at the other end of the train! We played it cool though by speed walking down to the other end of the platform a little, freaking out once everyone else had hopped on and then realising we could just jump on anywhere and walk down inside the train. While we walked down inside the train we passed through the green compartment which was interesting. It looked like they had a few flight attendant-esque people in the carriage to look after the passengers. 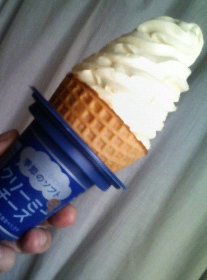 Even with the ice cream by the time we arrived in Sapporo we were starving so we immediately hunted down some food. The restaurant we decided upon served tempura soba and was located within the Sapporo station complex. When we went in we were directed towards a table at the back but as we approached we smelt cigarettes and realised that someone was smoking! Oh no! We left the restaurant but since we were really hungry and really wanted tempura soba we went back in and asked if we could sit at the stools towards the front. 2pm but since it was 2:30pm we had just missed it. The food was really delicious and satisfying and we wanted to have some tempura again ever since we had it last in Yamadera. While we were eating I noticed a sign saying that they were going to shut at 3:30pm for renovations with last orders at 3pm. We finished eating just as they put the closed sign out the front at 3pm. While we were at the restaurant we decided that we'd spend the rest of the afternoon by first going to the top of the attached JR tower that's attached to the station and then make our way to the nearby Mt Moiwa (藻岩山 = Seaweed + Boulder + Mountain = Moiwayama). The observation level of the JR tower is located at the 38th floor (T38) which is 160 meters above the ground. After exiting the restaurant we made our way through the station to the 6th floor where we bought tickets and caught an elevator to the observation floor. There were wide windows and you could walk around the whole top area and get a good view in all directions. We could even see our next destination in the distance! Since we wanted to get to Mount Moiwa before sunset we stayed up the building just long enough to appreciate all the views and take some photos. After descending the JR tower it was time to make our way to Mt Moiwa! The most touristy and fun way to ascend this mountain is via a ropeway/cable car system which is most easily accessed using Sapporo's only tram which can be caught after getting a subway to Odori or Susukino stations. After buying a discounted subway/tram combination ticket from a ticket machine at Sapporo station we caught the tram to Odori station and walked to the Nishi-Yon-Chōme (西４丁目 = west 4 city block) tram stop. The tram trip took a little while since it was a tram. I think about 30 minutes all up. Kate saw a zero calorie 7-up from the tram window but apart from that nothing eventful happened and we used our combination ticket to exit once we arrived at our stop (ロープウェイ入口 = RoopuWei IriGuchi = Ropeway entrance). There's a free shuttle bus that leaves from near the tram stop and takes passengers to the ropeway entrance but unless it's there when you arrive it's not worth getting as it takes the same amount of time (5mins) to walk or get the bus. It wasn’t there when we arrived so we just walked the short distance up to the rope-way station. At the station we bought return tickets all the way to the top which came to 1700 円 each. Since there were two stages to the ascent/decent this meant we had four tickets. The ropeway bit came first and was the style that has just two big cabins which go from one station to the other- crossing half way (rather than little ones that leave continuously in a loop). We had a short wait since the cabins were currently in transit between the stations. Once it arrived we hopped in along with everybody else who was waiting. I think the cabin was about 1/4 full with us all in it. When we got off at the other end (about 3/4 up the mountain) the mini cable car was there waiting for us so we walked past a shop, got our ticket stamped and jumped straight on. The mini cable car had two small bubble shaped pods that were attached to each other and looked more like a ropeway cabin than a cable car carriage (which usually look more like trains). We ended up taking the top pod although I think the bottom one would've provided better views. There was a little building at the top with views from inside the building. We spent quite a while taking in the view and since it was near sunset we got to see the view during the day and night. The view was amazing and we took lots of photos! It wasn't very crowded while we were there (nothing like Hakodate) and I noticed that two guys who were supposed to be working there as photo takers were slacking off a bit- which was funny. People in Japan usually look like they take their jobs very seriously. I also rang some sort of "lover’s bell" for no particular reason- around the bell there were lots of locks with couples names etched into them. Once night set in it actually got pretty cold outside so we retreated indoors. Inside there was a restaurant, a place selling giant pretzels and a planetarium. I was a bit interested in the planetarium but we didn't go in as it was a little expensive. There were also some seats next to some big windows where we sat for a while and took in the view. Every so often there was an announcement stating that the mini cable car was about to depart. While we were sitting on the seats we heard it and decided that it was time to head back. I resisted the delicious looking hot milk that was for sale but ended up with a few extra packets of those caramel lollies. Once we reached the bottom we found the shuttle bus already there waiting for us so we hopped on. For some reason it didn't leave straight away, even though everyone from the ropeway had already boarded. Just as we were contemplating whether or not we should just get off and walk- it took off. We got on the next tram which looped back around to Susukino and purchased another subway/tram combination ticket as we got off. 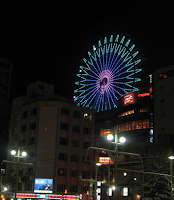 Susukino (すすきの) is the main entertainment district in Sapporo and is in fact the largest in Japan north of Tokyo. We thought we'd spend the rest of the evening having a look around! Since we had such a big lunch we ended up just getting dinner at one of the 7-11's where I also got some more money out of the ATM. I can't remember what I had but another one of those cheese ice creams may have been featured. One of the things Kate got was some portioned packets of nuts- apparently so she wouldn't eat them all at once. Although she ended up having 3 out of the 4 packets anyway! 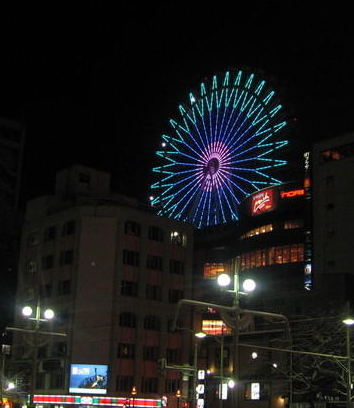 From the streets we could see a big Ferris wheel that we wanted to ride and get a final view of Sapporo. We had major difficulties getting to it though! Every time we got close it would get obstructed by tall buildings and we would end up walking past it. After walking for a while towards it we’d find it was behind us so we’d go around the block again and repeat. I think we ended up walking around in a circle at least 3 times. Finally we realised that it was actually in one of the buildings we were walking around- the norbesa entertainment centre. Upon entering we saw signs advertising the Ferris wheel on the front door. It was quite quiet within the store for some reason- perhaps because it was Monday night? While we were making our way up to where the Ferris wheel was we stumbled upon a Mandarake! Mandarake is a large anime chain that specialises in used goods such as figurines, manga, doujinshi and the like. Since darake (だらけ) is a grammatical word that means "to be covered by", I suspect that the name might mean something like "Covered by manga" with the "man" short for manga. That's just my theory about the meaning though. I can't find any conformation on this. This particular Mandarake store seemed to specialise in figurines- it was quite big and we had a little look around though I didn't buy anything. After finishing with Mandarake we made our way up to the Ferris wheel. It just so happened that they were having a special promotion and a ride on the Ferris wheel was reduced by 50% to only 300 yen each! We were a bit wary as no one else was riding the Ferris wheel and Kate was a bit freaked out while we were going up. 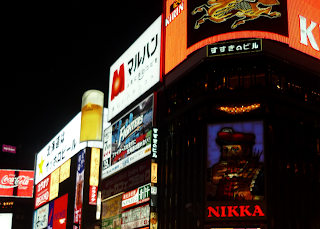 It was a fun trip around nevertheless and gave us one last view for the day of sapporo! We spent the rest of the night wandering around Susuniko before returning to our hotel after another interesting and fun day in Japan!